Businessman Robert Vadra, the brother-in-law of Congress chief Rahul Gandhi, has denied owning a series of properties in London during his four-hour questioning by the Enforcement Directorate today, sources have said. The central probe agency grilled him in a money laundering case at their office in Delhi this evening. A court has given Robert Vadra immunity from arrest till February 16, but also asked that he join the investigation. Mr Vadra, who is also the son-in-law of Congress leader and UPA chairperson Sonia Gandhi, has said he is being subjected to "unwarranted, unjustified and malicious criminal prosecution" for political reasons. 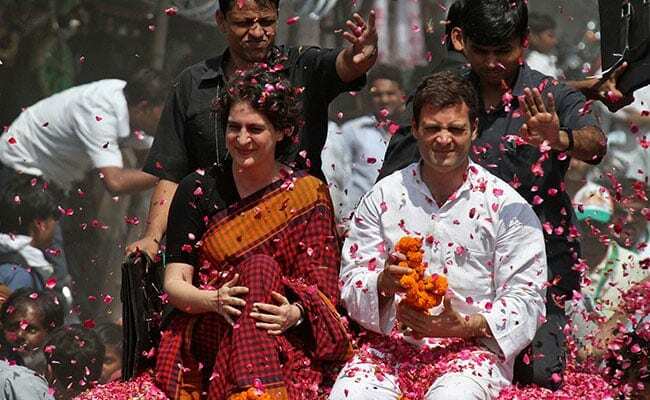 His wife and Rahul Gandhi's sister, Priyanka Gandhi Vadra, recently joined active politics as a general secretary of the Congress. In a big signal to the BJP, which has been targeting her over the allegations against her husband, Priyanka Gandhi Vadra dropped him off at the agency's South Delhi office today. "I stand by my husband," she told NDTV, adding that she wanted to send a "clear message" by her appearance at the ED office. The case involves nine London-based properties allegedly owned by Mr Vadra. Three of these are villas, the rest luxury flats - all purchased between 2005 and 2010. The agency has also told the court that two of the houses are worth around 9 million pounds (approximately Rs 83 crore). "We just want him to come and inform about his properties," the Enforcement Directorate counsel had said in the court. Sources told NDTV that the questioning will also involve his relation with Manoj Arora, and he will be confronted with his emails and statement made under the Prevention of Money Laundering Act. Manoj Arora, an employee of Skylight Hospitality, a firm linked to Mr Vadra, is a key person in the case. He was aware of Mr Vadra's undeclared assets overseas and was instrumental in arranging funds, the agency has alleged. Mr Vadra would also be asked about the alleged kickbacks received during the UPA government in defence and petroleum deals, sources in the agency said. "Gone are days where he possessed only one property in London. Now it is eight properties, each costlier than the other... One is worth 1.89 million pounds (about Rs 17 crore)," said the BJP's Sambit Patra. All this, he said, was funded by kickbacks when the UPA was in power. Quoting an e-mail trail, Mr Patra said the funds came from a series of companies floated to "turn black money into white". There are also allegations that Mr Vadra received undue favours in terms of property from the Haryana government under Bhupinder Hooda.